Be compatible with Mageplaza extensions: SMTP. (1): Your customer service team keep answering the same questions which causes unnecessary increased workload. Yet, it’s still inconvenient for customers to reach your team to ask common - simple questions. (2): To solve the problem, you may consider display FAQs on every page, so your customers can look for product questions easily. However, featuring the same frequently asked questions on all pages can cause duplicate content which is unhealthy for SEO. 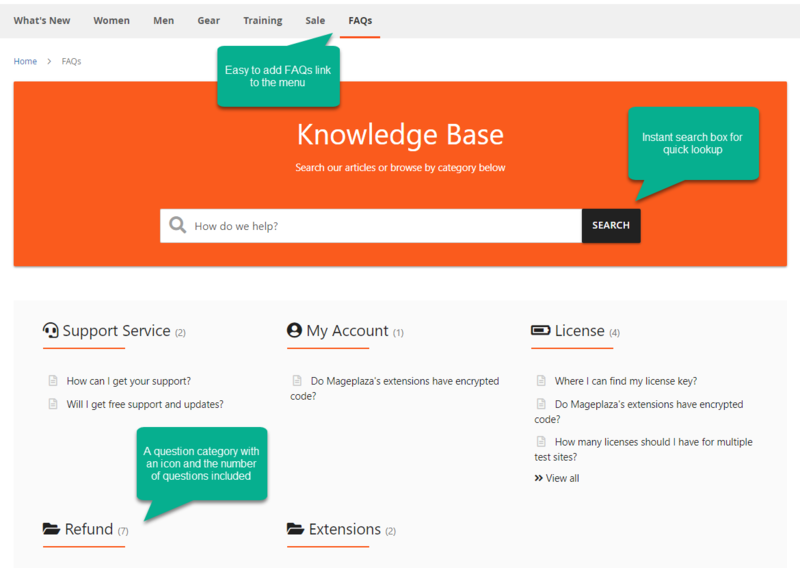 FAQs extension can help your Magento 2 store cut down workload while avoid duplicate content by building a separate Knowledge Base page. Within this page, customers can look up, ask their own questions and receive answers professionally. By letting customers/shoppers leave questions and get answers from your store on a regular basis, your site’s content is always kept up-to-date and new. Search engines highly appreciate this feature as they will find your website active, informative and useful for users. Besides, as mentioned above, having a FAQs page can help you prevent duplicate content which is extremely harmful for your ranks on search engines. Customers want everything to be quick, especially when they have problems/questions which need solving. An FAQs page can help your customers save a lot of time searching for already-answered questions. 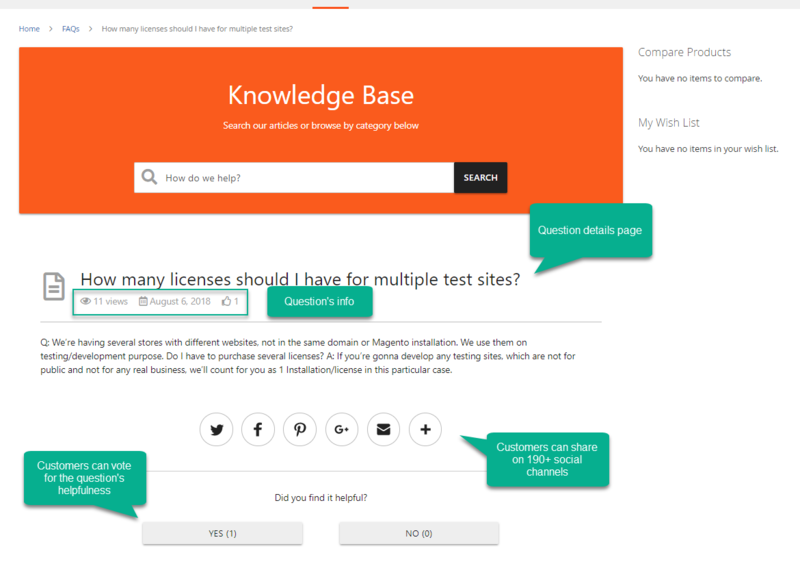 Also, the FAQs module can boost customer engagement by allowing them to read more, vote usefulness and share. 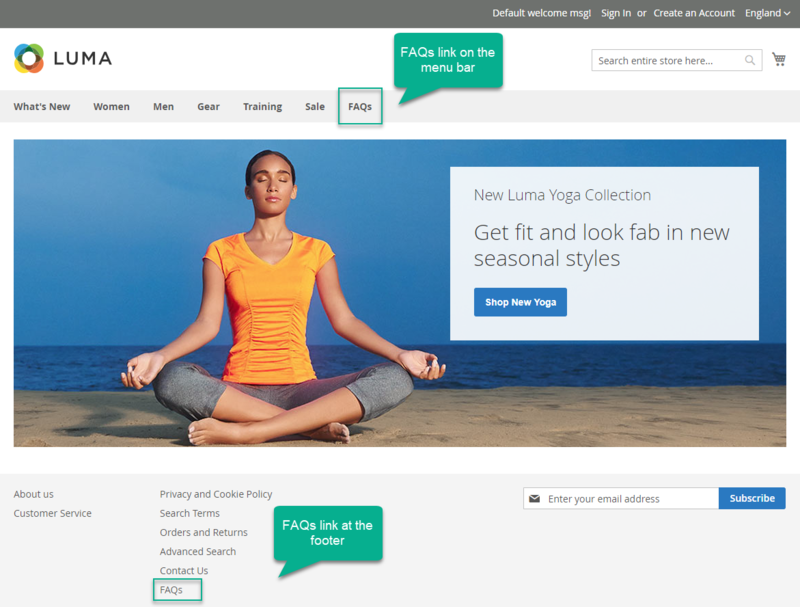 The FAQ homepage is optimized to boost user experience by creating as much convenience as possible. 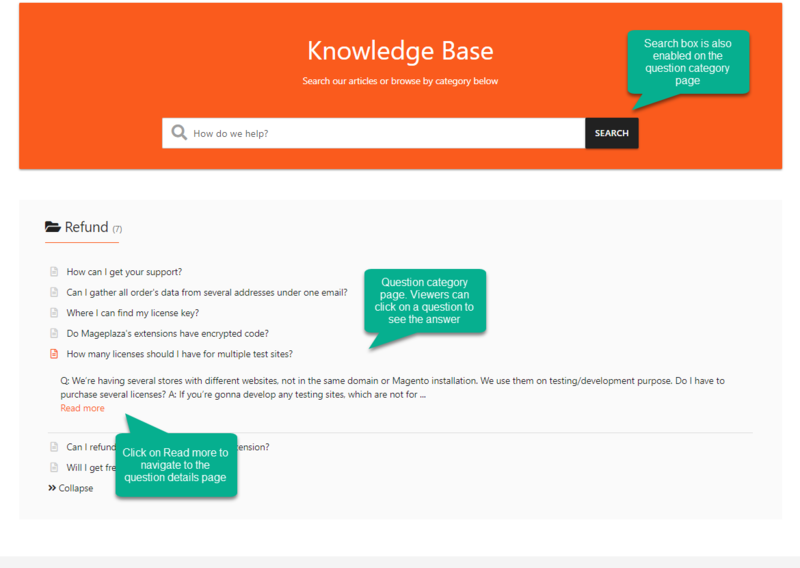 On the Knowledge Base page, an instant search box is displayed right on the top, allowing users to type in some characters to look up the questions. Questions are classified into specific categories. How many questions showing up in a section is defined by admins. 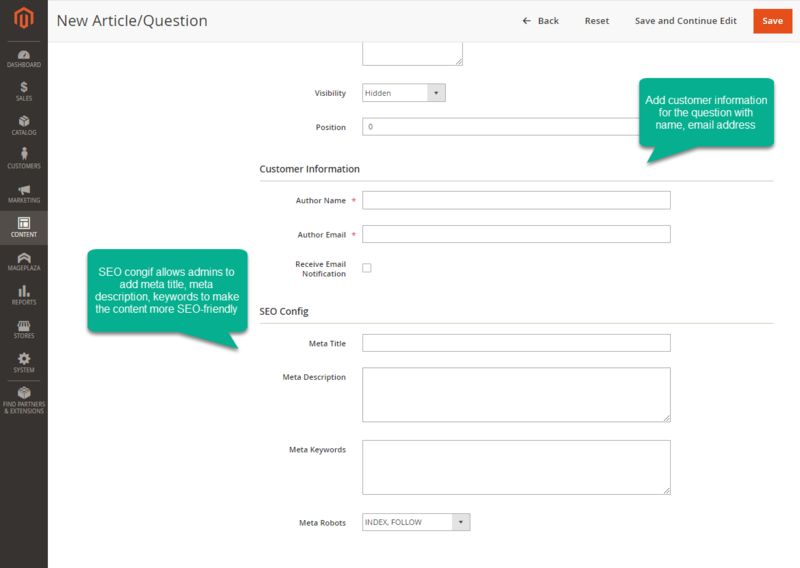 Customers can click on the section title to read all questions, or click on the question to view the answer. 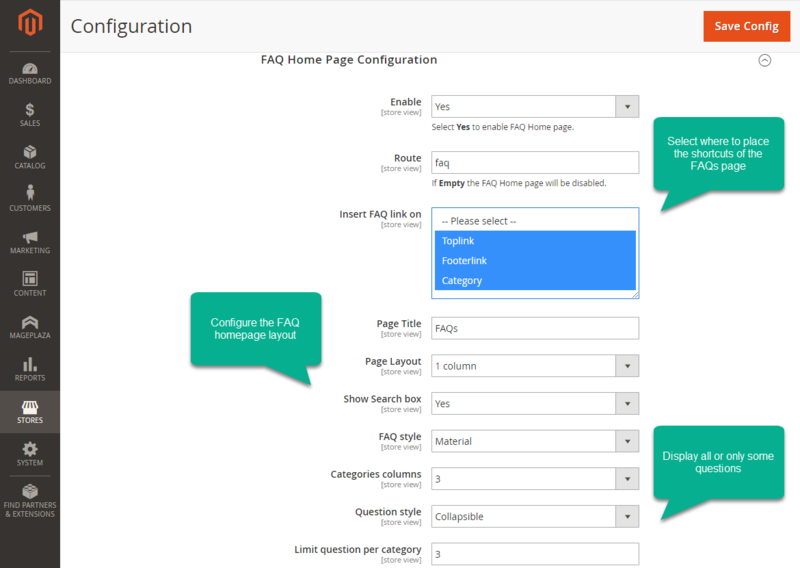 Admins can change URLs for each question page, question category page or FAQ homepage to make it more friendly to search engines. This is also more friendly for customers as the URLs can be more human-readable. 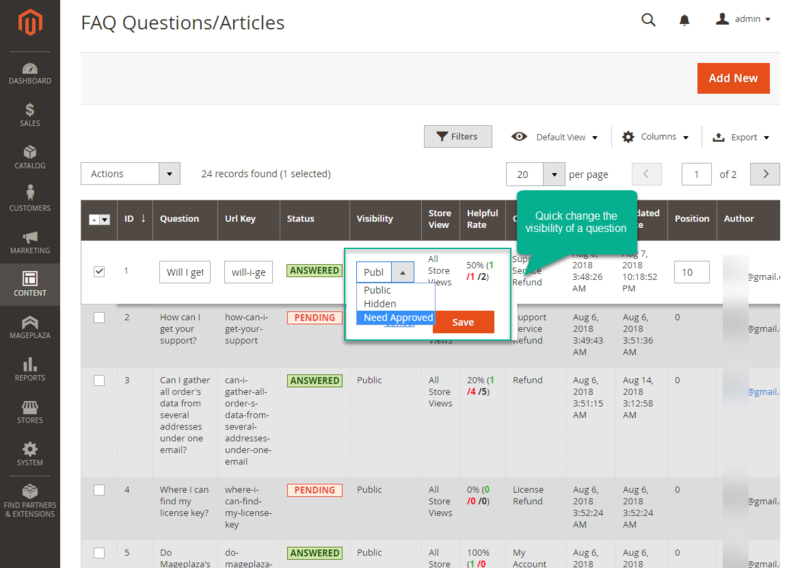 Besides, admins can set and edit meta title and meta description for each question or for the FAQ page. Hence, this helps improve search engine optimization. 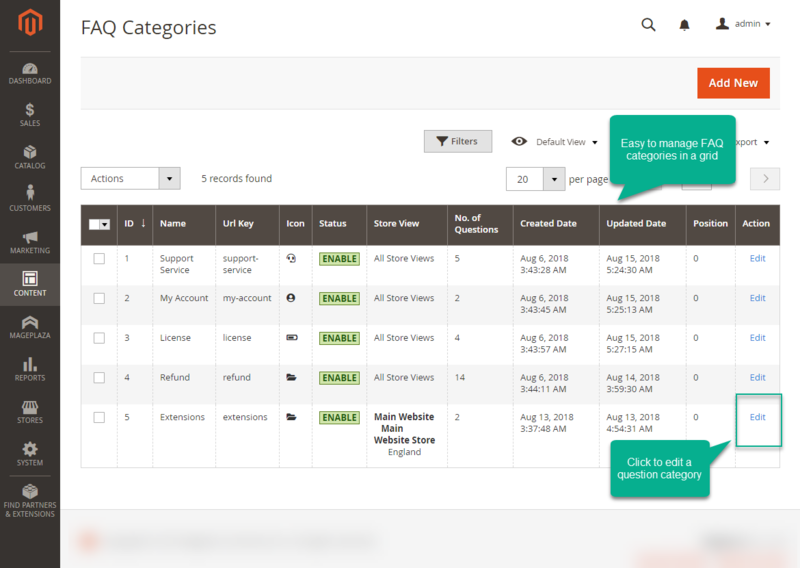 Frequently asked questions are featured neatly in different categories which are shown under the question search box. 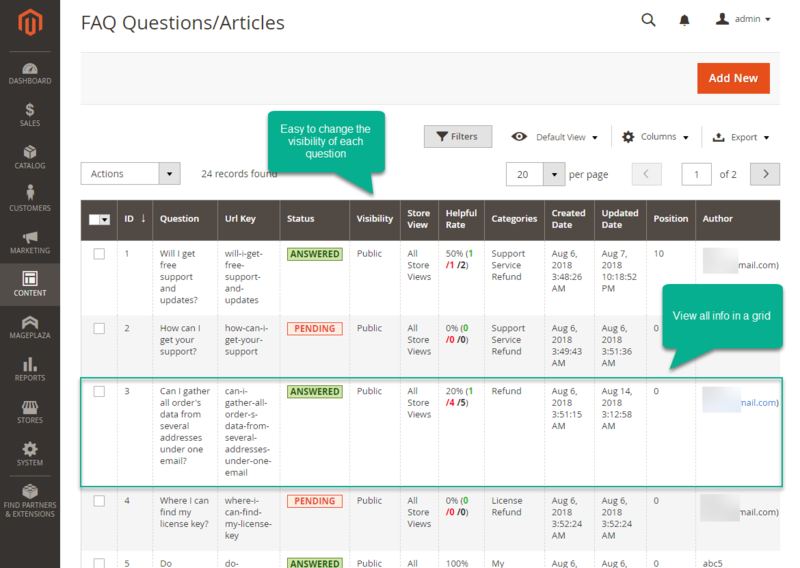 By each category title, the number of existing questions is displayed. Admins can also choose an icon and position for the category on the backend, and pick which questions are allowed to show up in each category. 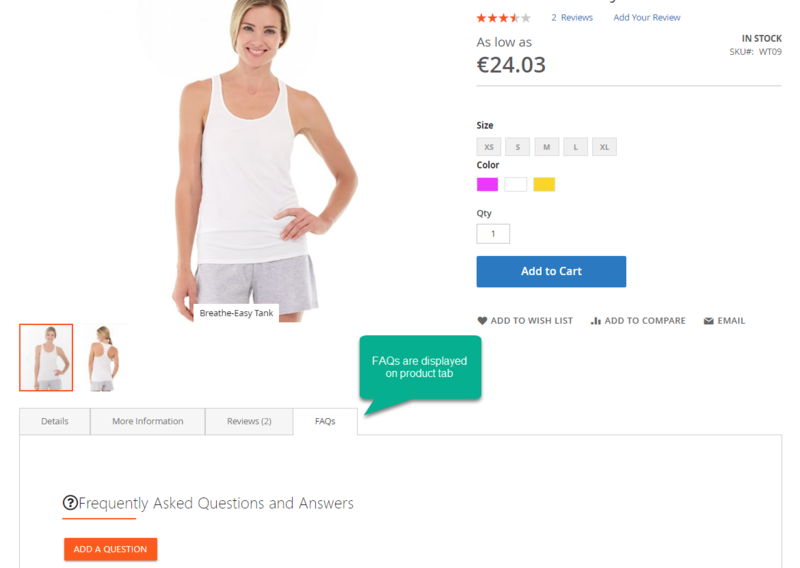 Answers can be also displayed or hidden, and allow or disallow customers to click on Read more to navigate to the Question details page. An instant search box is featured nicely on the top of the FAQ homepage. 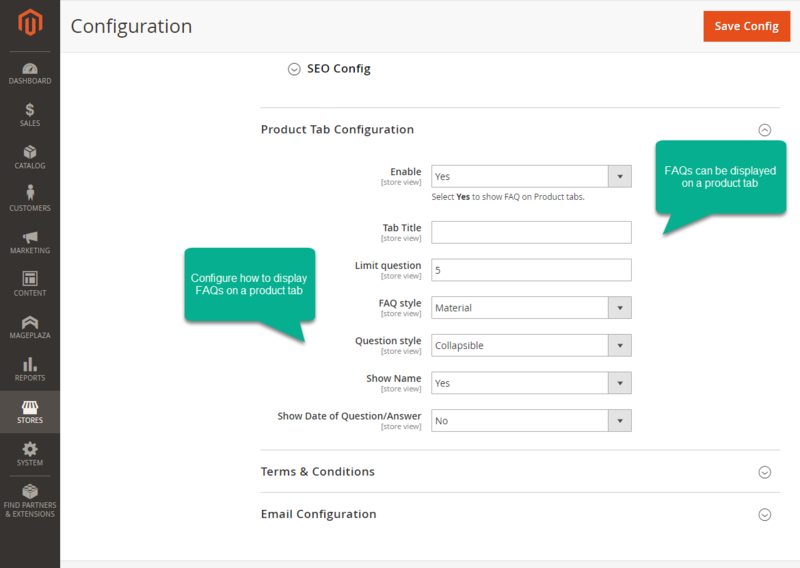 Customers can look up questions by typing in one or some characters depending on admin's configuration. The color of the instant search title can be set on the backend. 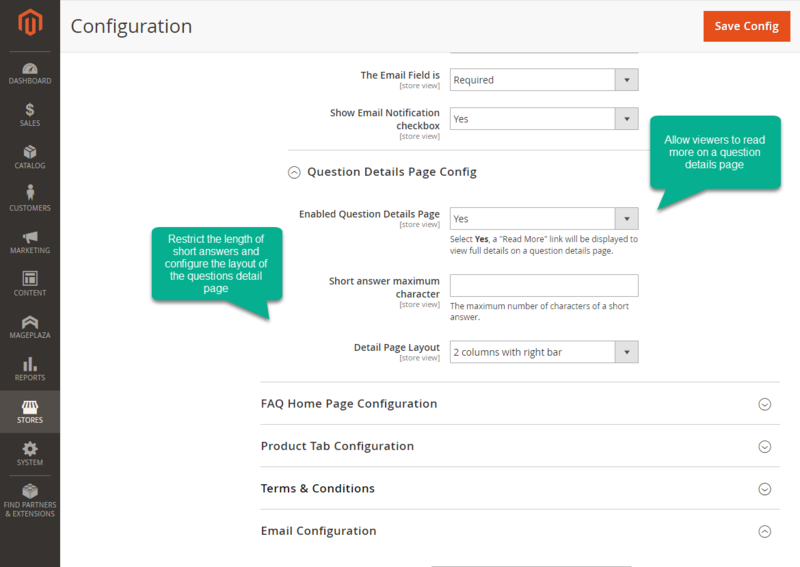 Admins can decide how the FAQ pages look by configuration. 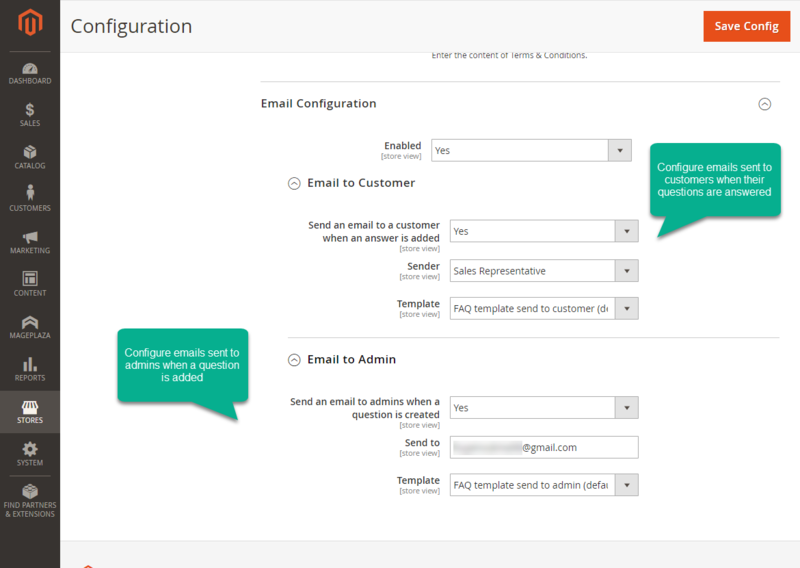 The theme color can be set on the backend while some features are able to be displayed such as: name or email. Admins can allow displaying only some first words or each answer instead of showing the full one. 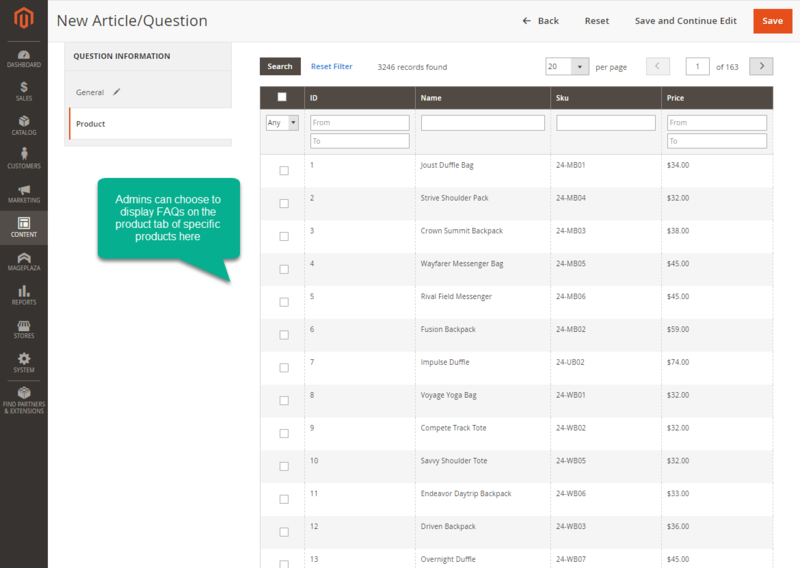 Answers can also be collapsible or shown as default. 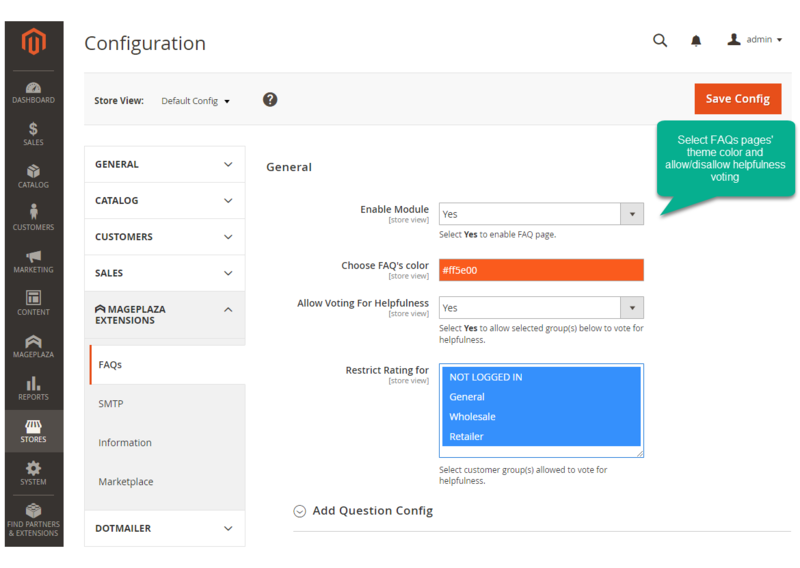 The questions voting feature in FAQ extension allows viewers to assess the usefulness of each question. Ratings can be restricted to certain customer groups only. 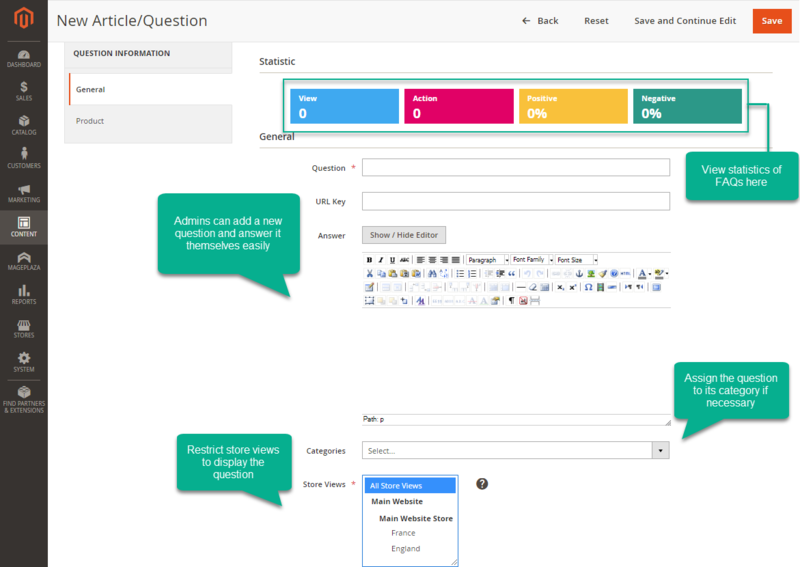 Allows customers who view the questions share them on social channels. Support Facebook, Twitter, Google + and over 194 other services. 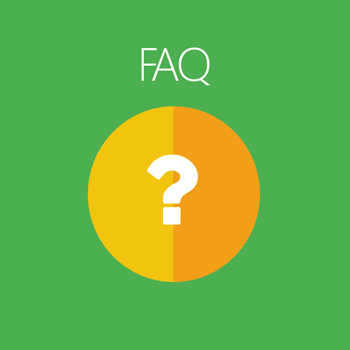 Admins can restrict to display FAQs to certain customer groups only, allow or disallow guests to leave questions. 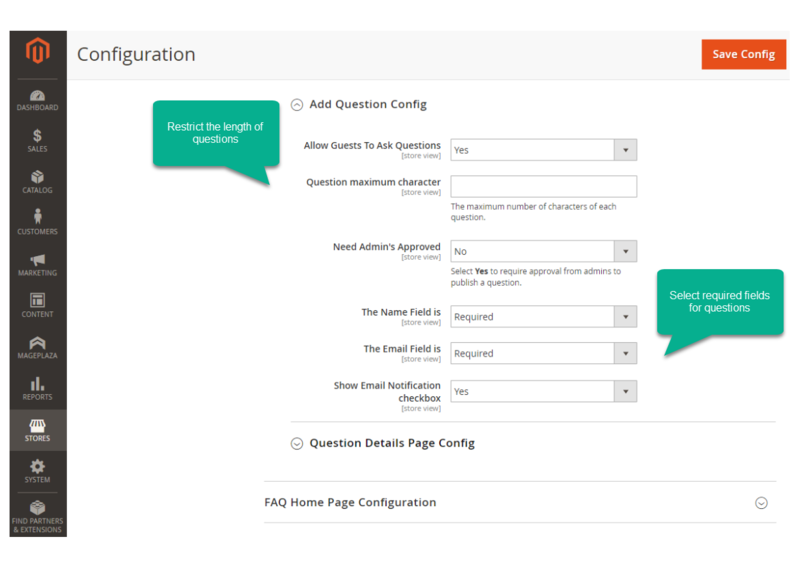 Admins can view FAQs' statistics easily on the backend. A brief report including figures on Views, Action, Positive and Negative. Fully compatible with Google reCAPTCHA extension to help add invisible CAPTCHA to the Ask the question form. Allow/disallow robots to index or/and follow. filter_drama When a customer submits a question, will her/his name be hidden if the question is hidden? No, the name will be displayed. filter_drama How can my customer submit a question? 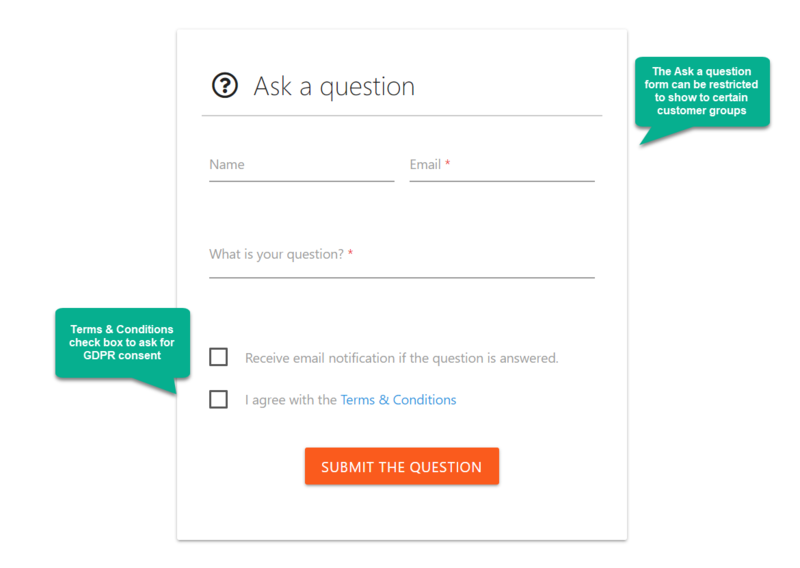 Your customer can visit any question details page, and leave a question on the Ask a question form. filter_drama Why can't a customer find a form to submit a question on the Question details page? This is because you do not allow customers to submit a question. filter_drama Why does my customer receive no notification email when the answer is already public? Please make sure you enable the email notification on the backend. filter_drama A question with its answer is public but cannot be search on the FAQ homepage. Why? This may be because you haven't assigned the question to any category.